War refugees, Muslim or otherwise, have suffered horrific trauma and deserve care and compassion. 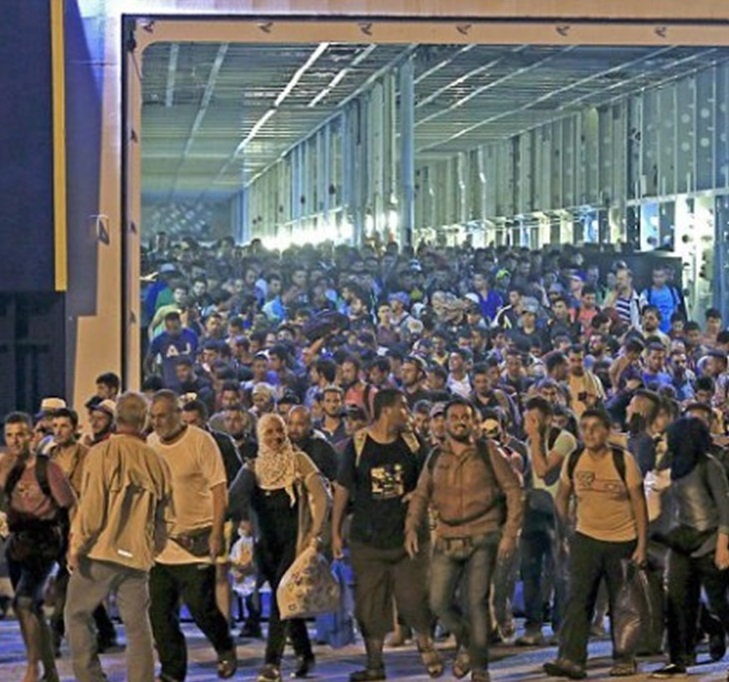 The number of Muslim refugees in Europe, UK and even America has risen sharply. Who exactly are these refugees? Where did they come from, and where are they going? And what do these Muslim refugees do after they reach their destinations? 1. Where do the Muslim refugees come from? Syria, Afghanistan, Iraq, Kosovo, Albania, Pakistan and Iran are predominantly Muslim nations. According to the chart above, most of the Muslim refugees appear to be coming from the war zones of Syria, Iraq and Afghanistan, but this is based on their claims, which are difficult to verify since most arrive without passports. But the demographic composition of these Muslim refugees is unprecedented and raises serious questions. 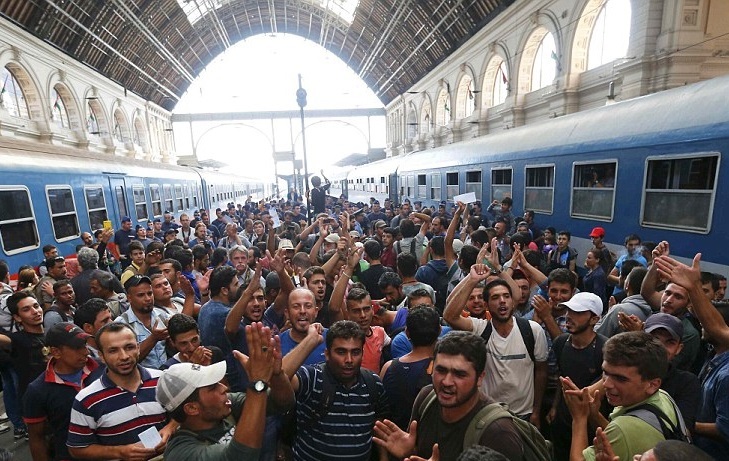 2. Who are these Muslim refugees? Refugees fleeing all other wars in history have been majority women, children, the old, and the wounded; able-bodied men of fighting age remain and fight to defend their homeland. Below are two photos. One is of Muslim refugees arriving in Europe by ship. The other is of 2,200 Muslim refugees just after they arrived in western Europe (Munich, Germany) by train. What do you notice about their gender, age and physical condition? 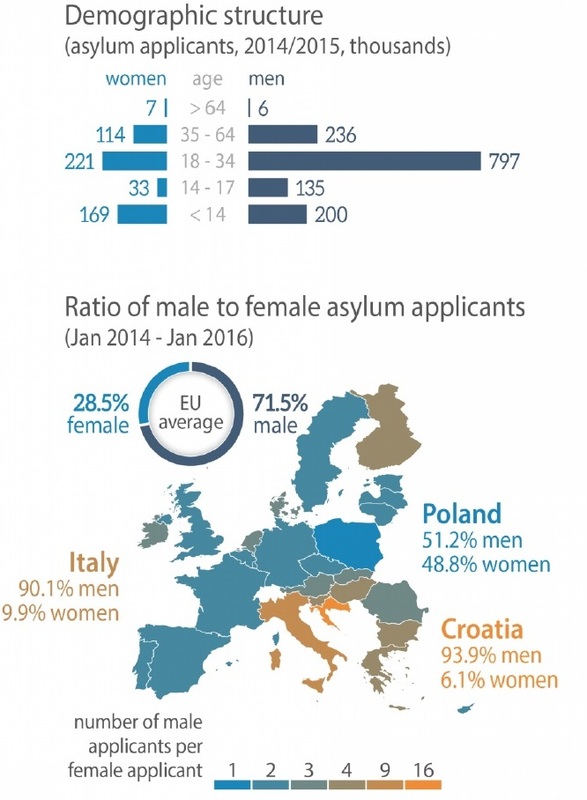 As the chart below confirms, the majority (71.5%) of the refugees arriving in Europe are men, including an extremely high proportion of fighting-aged (18 to 34 years) men. The Demographic structure below shows 1.174 million (6,000 + 236,000 + 797,000 + 135,000) men (14 years & older) arriving while 0.375 million (7,000 + 114,000 + 221,000 + 33,000) women (14 years & older) arrived. Since men are the main combatants and casualties in war, fewer men than women should arrive as refugees. But even if the above figures were to be adjusted to an even 1:1 ratio between men and women (14 years of age & older), 799,000 men, equal to 68% of all men who arrived, exceeded the expected 1:1 gender ratio. 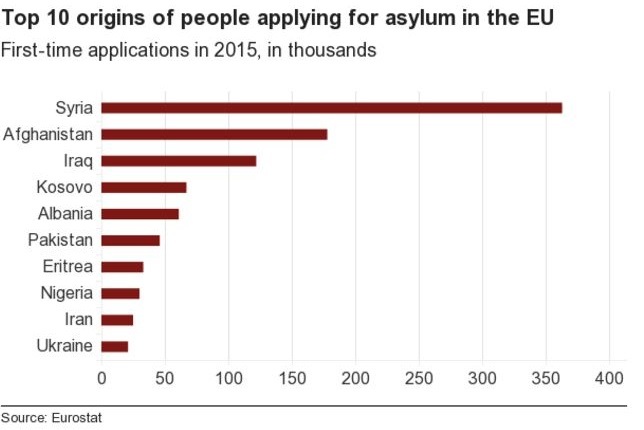 Who are these 68% - more than 2/3 - of the men, predominantly young and Muslim, who enter Europe as refugees? The answer to the next question gives us a hint. 3. Where are the Muslim refugees going? War refugees typically seek shelter in a safe nation near their home country and wait for the war to end so that they can return home. As the map above indicates, the Muslim refugees entering Europe are venturing thousands of miles past such safe nations to reach those that offer generous welfare benefits. This hints at the answer to the above question: many of the Muslim "refugees," including the disproportionate of young men, entering Europe are not war refugees. But by posing as refugees, they both gain legal entry into Europe and receive generous welfare benefits, including free housing, food, healthcare and education. 4. 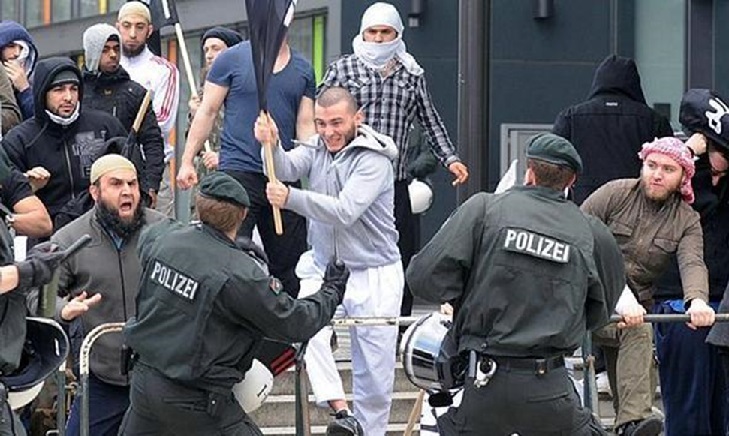 What do these predominantly male Muslim refugees do in their host nations? Refugees are typically grateful to their hosts who receive, shelter, feed and clothe them. 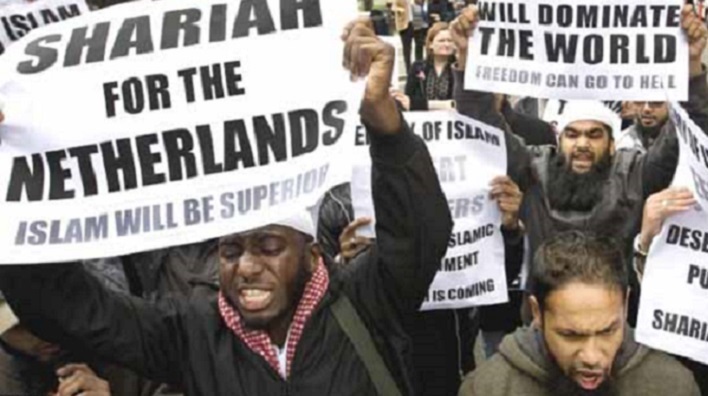 The Muslim refugees in Europe have expressed their gratitude to their hosts by raрing the women (see Islamophobia and Taharrush), attacking the men, and demanding that the host nations adopt Sharia law (see below). 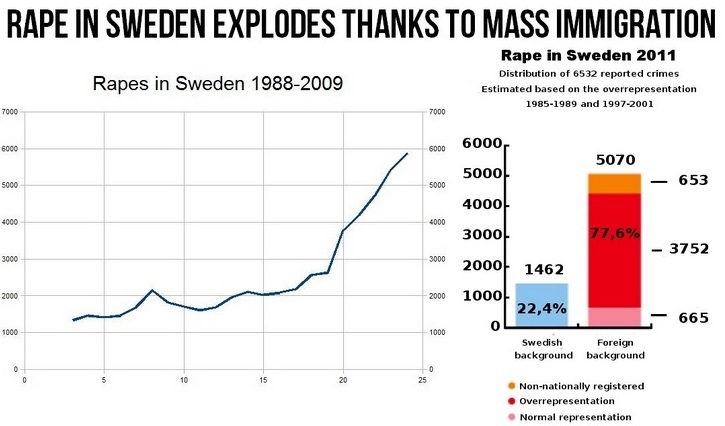 The chart below shows a 500% rise in rapes in Sweden. Prior to the arrival of immigrants, Sweden was one of the safest nations in the world. It now has the highest rate of raрe in the world outside Africa. Nearly 80% of the raрes in Sweden are committed by immigrants (right), the dominant majority of whom are Muslims, while almost 100% of the raрes by strangers in the neighboring Norwegian capital of Oslo in 2016 were committed by non-native Norwegian Muslim men against native Norwegian girls and women. At the bottom of this page is a video, since banned in Germany and by Facebook as "hate speech," of a 16-year-old German girl pleading for protection against raрe. 1. End the Schengen Convention and re-establish border controls. 2. Stop the mass immigration of Muslims into countries that are far from their homelands. 3. Deport the Muslim men who behave as above. See Stop Islam for the other steps that must be taken, none of which will be easy. But the choice for Europe is to take them and survive or to not take them and prepare to live under Sharia. Should any refugees be retained or accepted? 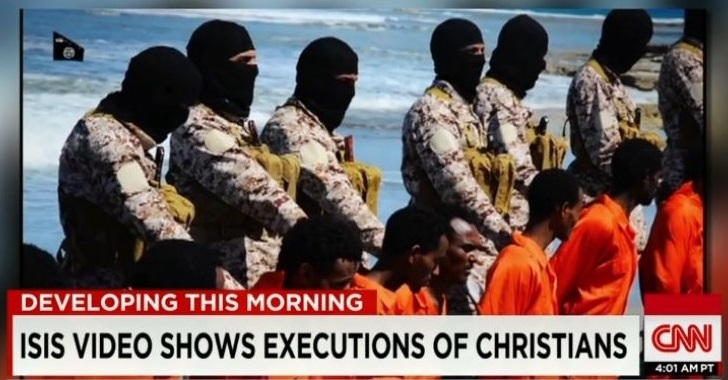 Yes, the Christians, whom the Muslims are exterminating in Syria, Iraq, Afghanistan, Egypt, Nigeria and elsewhere in the Middle East and Africa (see War against Islam). They are the truly homeless refugees who will face death if they return home.